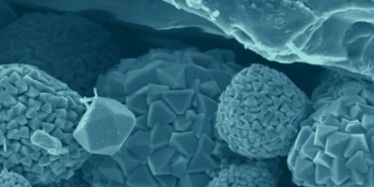 Common in many parts of the world, acid sulfate soils are saturated with water, almost oxygen-free and contain microscopic crystals of iron sulfide minerals (commonly pyrite). Acid sulfate soils are safe and harmless when not disturbed. If acid sulfate soils are dug up or drained they come into contact with oxygen. The pyrite in the soil reacts with the oxygen and breaks down. This process turns pyrite into sulfuric acid, which can cause damage to the environment and to buildings, roads and other structures. The acid also attacks soil minerals, releasing metals like aluminium and iron. Rainfall can then wash the acid and metals from the disturbed soil into the surrounding environment. Read more on the impacts of disturbing acid sulfate soils. What do acid sulfate soils look like? When acid sulfate soils are undisturbed, they are dark blue-grey (sometimes black) and wet, with no structure. They are often high in clay, but can be sands or sometimes even gravels. When acid sulfate soils are disturbed, the iron released from the pyrite breakdown forms a range of brightly coloured minerals—first yellow, then brown then red. Cracks open up on the soil surface, and the soil shrinks as it dries out. Most importantly, the soil pH drops from nearly neutral to extremely acidic, often below pH 2. Read more on identifying acid sulfate soils. How do acid sulfate soils form? Acid sulfate soils form wherever the following conditions are present. an anaerobic (oxygen-free) environment—which means a soil that is saturated with water. The lack of oxygen protects both the bacteria and the pyrite they create. the presence of sulfur (in the form of sulfate SO42-)—for the bacteria to ‘breathe’. Sulfate-reducing bacteria use sulfate and produce hydrogen sulfide (H2S) the way animals use oxygen and produce carbon dioxide. Sulfate is a normal component of seawater, so acid sulfate soils commonly develop along the coast. Iron, in its reduced form (Fe2+), reacts with the hydrogen sulfide (H2S) produced by the sulfate-reducing bacteria, to form pyrite (FeS2). Iron is a very common mineral, so there is rarely a shortage in the environment. As pyrite forms, bicarbonate also forms from the same reaction. If it is not removed from the environment, the pyrite-forming reaction eventually slows and stops. Water movement (like tidal flushing of the system) will remove bicarbonate and leave the pyrite behind, allowing it to accumulate. The components required for acid sulfate soil formation (view large version). Time is required for pyrite to accumulate. Unlike many other soil processes however, pyrite accumulation can happen very quickly. A few years can be enough time for a significant amount of pyrite to form. View this animation from the Victorian Resources Online website on how acid sulfate soils form. Where are acid sulfate soils found? 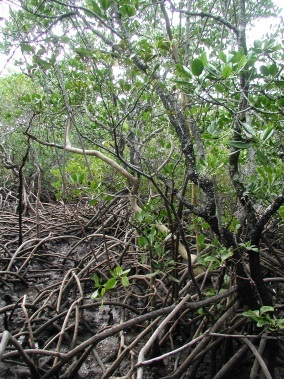 New acid sulfate soils form naturally in swamps, especially mangrove forest areas and salt flats. 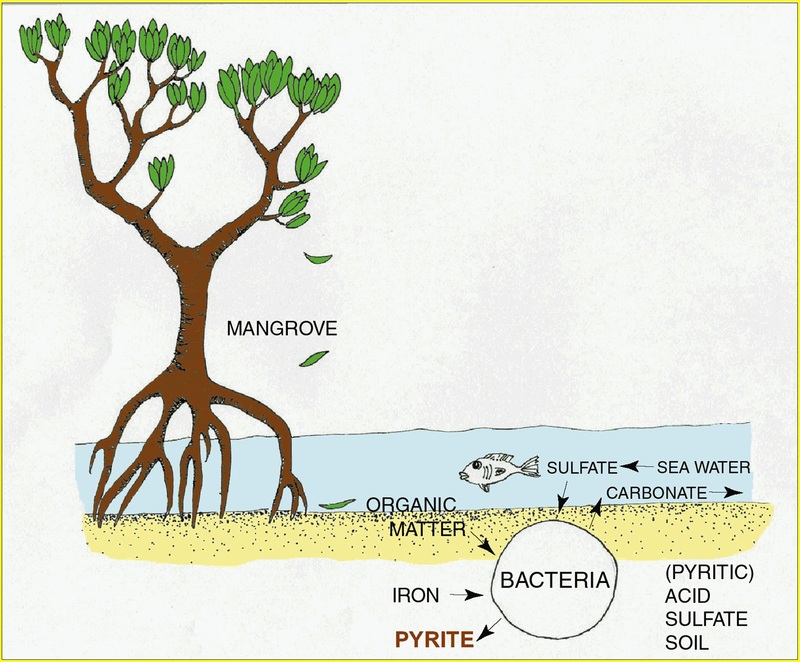 Older acid sulfate soils can be found where mangrove forests and salt flats existed in the past. Acid sulfate soils can form in parts of inland Queensland where there are appropriate conditions (listed above)—e.g. some of the salt lakes in western Queensland have acid sulfate soils present. Around 35,000 years ago, the sea level in Queensland was higher and large swamps existed in many places along the coast. Since then, the sea has retreated and newer layers of soil have been transported from the hills, covering the former swamps. This is why many coastal plains have a layer of acid sulfate soil hidden below the current soil. Coastal areas lower than 5m AHD (Australian Height Datum) are likely to have acid sulfate soils present. Acid sulfate soils can also be found buried beneath newer soils at elevations below 20m AHD. Acid sulfate soils have only been mapped in some parts of Queensland. However by looking at coastal areas below 20m AHD, estimates about the extent of acid sulfate soil in Queensland can be made. Around 23,000km2 of the Queensland coast is likely to contain acid sulfate soils, with around 6600km2 in catchments that flow to the Great Barrier Reef. By comparison, the area governed by Brisbane City Council is 1367km2. Read more on acid sulfate soils reports and maps. Guidelines for sampling and analysis of lowland acid sulfate soils.